Why Should You Design Your Lifestyle? You are here: Home / Dream and Decide Your Business Start-up / Lifestyle Design / Why Should You Design Your Lifestyle? Are you wondering why you should design your lifestyle? I had the most amazing walk today. 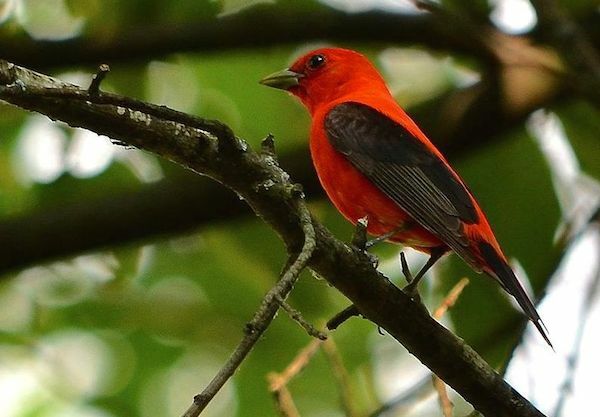 I saw two alligators and a scarlet tanager apparently they migrate through Florida in October. I learned this from a bird watcher. Who was happy to share his lovely discovery with me. Why do I share this with you? This is part of how I have designed my lifestyle. I have designed my life to include a morning walk. Sure there are other ways to get exercise but my favorite is getting outside and enjoying nature. I get my best ideas while walking. What’s your favorite way to exercise? I am naturally an introvert but many times, I force myself to be more introverted for various reasons. Taking a morning walk helps me wake up and lets me gradually greet people as I do. Like striking up conversation with the bird watcher. Time Magazine reports findings from the Harris Poll, which has conducted happiness surveys for many years, and of the 2202 Americans surveyed in 2017, only 33% said they were happy, in 2016 that number was only 31%. “Distraction and a lack of control may be part of the reason why only about a third of Americans say they are happy,” says John Gerzema, CEO of the Harris Polls. Choosing to shape your own life, to design your lifestyle the way you want to live, provides you with the power and capacity to achieve your dreams. Deliberately designing and planning your best life means you can carefully choose among the best possible options, you can achieve your dreams, and you have control over what happens to you and what you do in life. Your Greatest Life Cannot Happen by Accident. Shaping your life is a process that follows many principles, but ultimately, it is about taking the time to discover what you believe at your core and what you really want to achieve in life, then designing a road map to help you reach all your dreams. This process guides you through consideration of all the important aspects of life, not just your job or your financial future, and helps you identify all of the many components of a happy, healthy life. Patrick Hill, an assistant professor of psychology at Carleton University in Ottawa, Canada, evaluated data from the Midlife in the United States (MIDUS) study. They looked at how more than 6,000 study participants answered questions such as, “Some people wander aimlessly through life, but I am not one of them,” and others that aimed to gauge both negative and positive emotions. In 1979, Harvard Business School began a study on goal achievement where MBA graduates were asked if they had designed a roadmap for goal achievement by writing down their goals and creating a plan for attaining them. Just 3% of the graduating class wrote down their financial goals along with a plan to achieve those goals. 13% of the class had written goals but without an action plan to achieve them. The remaining 84% of the class had set no specific financial goals or plans. Fast-forward to 1989, the study subjects were contacted and revealed their progress in life. The 13% of the class which had written goals but not developed a roadmap for achieving them were making twice as much money as the 84% group which had no identifiable goals in mind. More importantly, the 3% of graduates who wrote down their goals and designed a roadmap were making a staggering 1,000% more money than the 84% group, and 500% more than the 13% segment. This shows the incredible power of living by design. When you design your lifestyle, you allow yourself to explore and connect with the many facets of life that bring you joy, meet your needs, and ignite your interests and passions. It is a deliberate and proactive approach to living that places the control firmly in your grasp and allows you to gain everything you want. Designing and actively shaping your life is proactive. It means you think ahead, anticipate possible problems, have solutions in mind for when things go wrong, and are in active control of your efforts toward achieving your dreams. It is a take-charge way of approaching existence that allows you to play an active role in how your life unfolds. Many people choose to play the victim in life. They wait for bad things to happen, then they wonder why there is nothing good in life. Their lives are reactive, always responding to the world around them. And most of these people have very little understanding of what they really want out of life. Designing your life helps you accept responsibility for yourself and your actions, provides you with a framework for getting to know yourself to determine your beliefs and goals, and gives you the tools you need to succeed in the face of setbacks and failures. When you shape your existence around your values and dreams, you can live a life of fulfillment and contentment. You can achieve self-actualization and achieve true happiness, as you have the tools to identify what you want as well as the personal strength to achieve them. A solid life strategy must be based on a foundation of essential elements in order for it to be successful. We’ll next explore these crucial components to help you start your life design journey with the right mindset and commitment.